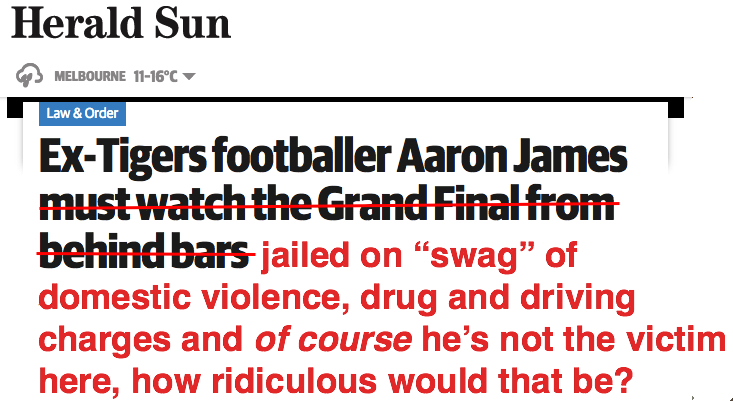 The Herald Sun reported that Aaron James pleaded guilty to a “swag” of domestic violence, drug and driving charges and has been remanded in custody pending further psychiatric assessment. James was accused of assaulting and stalking his ex-wife, threatening to kill her and breaching intervention orders. Other charges included drug trafficking and driving while suspended. Police also found around $10,000 of methamphetamine in his car. The first three paragraphs of the Herald Sun article are not what you’d expect from a court report about a violent drug dealer. Disgraced former Tiger Aaron James put his head in his hands and groaned on hearing he’d spend the AFL Grand Final behind bars. The 40-year old had hoped to watch his beloved Tigers run onto the MCG in the lead-up to the big game last weekend, but instead will wallow in jail. The on-field hothead, who launched his footy career with Collingwood in the 90s before moving to Richmond, has been described as a real-life Tony Soprano. How sad for him that assaulting, stalking and threatening to kill his ex-wife means he can’t go to a football game. How tragic that dealing ice means he has to go to jail. And look how glamorous and exciting his crimes are, he’s just like a beloved hero of a TV show! I can’t help but wonder how the first three paragraphs of this story would read if instead of being an ex-footballer Aaron James had been an Aboriginal man or a Muslim or an asylum seeker. Would he still be the colourful sympathetic character described in this article? Would the Herald Sun have mentioned in passing that he was “in trouble for harassing his estranged wife”? Would there have been a touch of the cheeky in a description of him as “somewhat of a hoon”? Would we have heard the touching statement that he “begged the court to release him in time for his son’s birthday”?